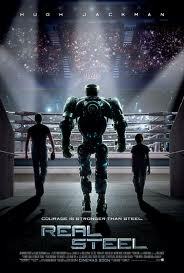 Real Steel is the story set in 2020 of Charlie, a failed boxer, father, friend and his constant struggle to make it big in the world of robot boxing. Along the way he discovers an 11 year old son, he knew nothing about and promptly sells and rediscovers his passion for boxing. Granted this is a Disney film but Holy Moly the acting was so animated I expected hand drawn blue birds to come a chirping. I normally love Hugh Jackman (who doesn't?) but his over acted smiley, winkey character here was off putting. For a while. Then comes Atom, the piece of junk, early model robot that they rescue from the scrapheap, literally. 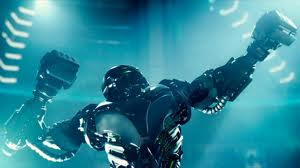 There is a constant hint that Atom is more than just a robot but its never developed. My youngest Gorgebag being my date for the night took exceptional pleasure in the crowds cheering for the bot as in the american accent, it sounds like they're cheering 'Adam, Adam, Adam'. He beamed broadly for the duration. This is a likeable story of the underdog and despite the overwhelming whiff of cheese from the characters the actual boxing was quite spectacular. 3 out of 4 in the audience leaned forward on their seats as the fights progressed, I found my own heart beating as I rooted for Atom along with the rest. 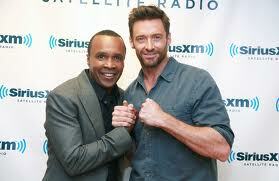 His shadow function allowing Jackman to showcase the hints and tips Sugar Ray Leonard showed him in training. Training sho' paid off. Buns of Real Steel! With a pumping score from the likes of Eminem & Fiddy Cent there's something here for everyone. Its a tale with heart that surprisingly manages to outshine its hammy actors. A daycent Sunday afternoon pic.